It really seems to be a proper spring day today, a little bit windy but warm with it, sunny, mild and the bees and butterflies are beginning to show themselves. We even cut the lawn in the back garden. 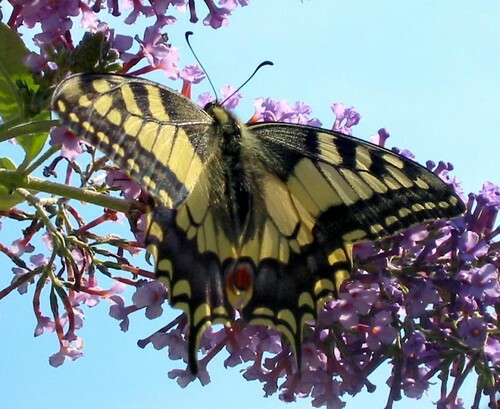 It's true that we didn't see the magnificent Swallowtail in the picture above though, that was taken in France way back in 2003. The pictures have always been a big part of this blog. I am by no means a photographic genius, I still get my F stops muddled with my extended octaves and bokeh is what happens when I try to watch television without my glasses on but modern digital cameras really take the strain of deciding what settings are needed quickly enough in most cases that quite dramatic photography is possible. I'd still like to be able to understand the principles involved, and I do to some extent but I don't have the feel for them that allows for sufficient fluency at speed and just prefer to be able to get on with it without having to stretch my brain for merely mechanical facts. The arrival of my first digital compact camera, a Canon Ixus 330 with a magnificent 2 megapixels of resolution in October 2002 really brought me the opportunity to explore photography as an art form. It removed the need to pay for film and development and meant that experiments were possible because chancy shots were cheap and painless to discard if they didn't work. 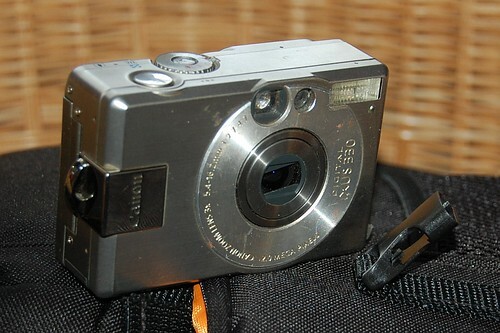 It was even better to discover that this little camera was so sturdily built that it's still going strong even now and I keep it as a useful backup. The Swallowtail was taken with this camera, admittedly with Paul behind it but that butterfly was a real tease and required a long reach to get it in the frame. We've never managed a better shot of one even though we now have far more advanced and expensive kit. These days I use a Nikon D40 originally chosen by Paul for himself. He's since replaced it with other more recent models but this camera with a Nikon 18-200MM F3.5-5.6G IF-ED AF-S VR DX lens does nearly everything I ask of it and manages the close-ups of flowers and insects interspersed with pictures of birds flying away and long shots of the vegetable patch extremely well. 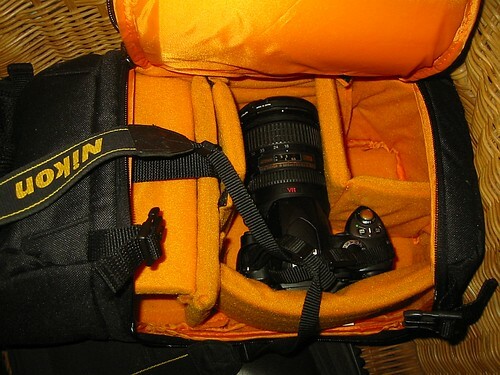 I've grown to love it so much I've just bought it a camera bag after several years of toting it around in a carboard box. Here it is, snuggled down in lovely orange luxury. Laura is hardening off her chillies in Sweden . Langdon is eating Devil's Club aka Oplopanax horridus. Sophie has been to Whitmoor Common. I never owned a camera before the age of digital ones...I could never quite stomach the idea of spending all the money on film and then getting it developed, etc...you're right, digital cameras opened up a whole new world. Thanks for stopping by my blog...I've been gone for so long, it's hard to get back into it. I'm planning on at least getting back to doing the rounds on everyone else's blog.